Simple DIY work may need. By drilling into the wall will get more load. refer size detail in description. This is the best deal in local market Singapore. We are the original supplier. Distributors are welcomed. Say bye to messy daily skincare and makeup bottles and brushes. By mounting a simple and elegant 2pcs set dressing table on the wall, it saves a lot of space and gives your room a brand new look. 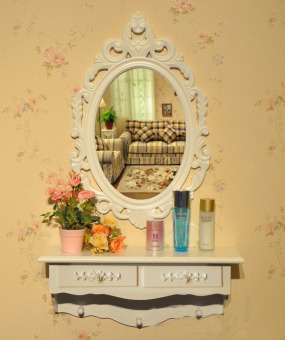 Moreover, this vanity style dressing table will fulfill the little one's princess dream with affordable price.